Over the past couple years, a number of companies that have traditionally been geared towards producing computer hardware have shifted their focus a bit to the mobile device market and have unveiled wireless storage devices aimed at mobile users. 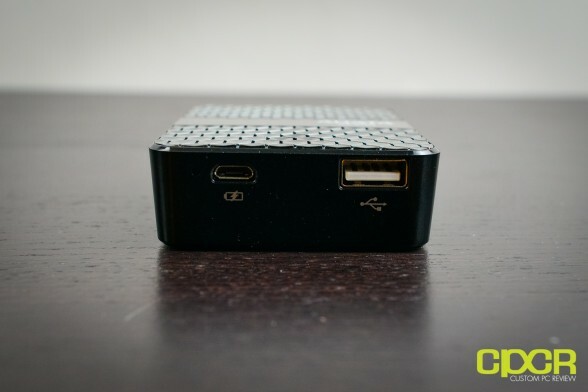 These devices are generally battery powered and include some sort of wireless functionality that allow PCs and mobile devices to connect to them. Kingston for example has the Wi-Drive, Patriot has their Gauntlet, Corsair recently introduced their Voyager Air, and now ADATA has the DashDrive Air. While all of these devices serve a similar purpose, they all have unique features that set them apart. 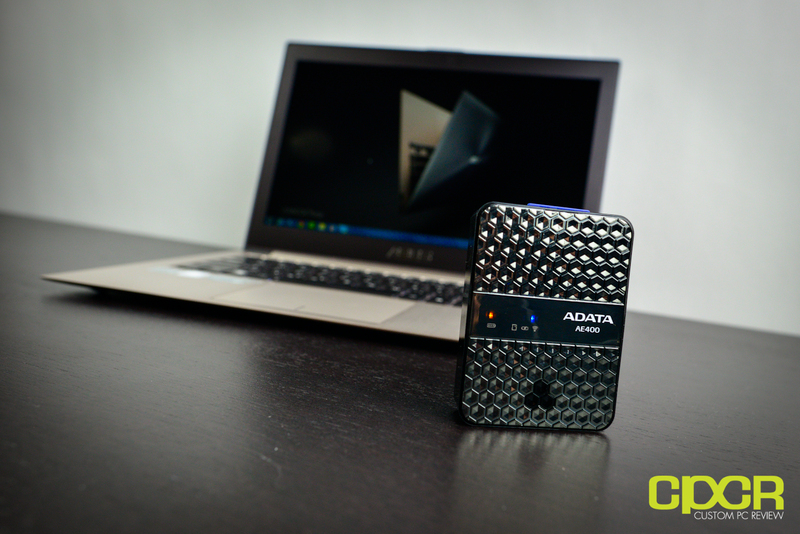 Today we’ll be reviewing the recently introduced ADATA DashDrive Air AE400, which ADATA describes as a “wireless storage reader and power bank”. 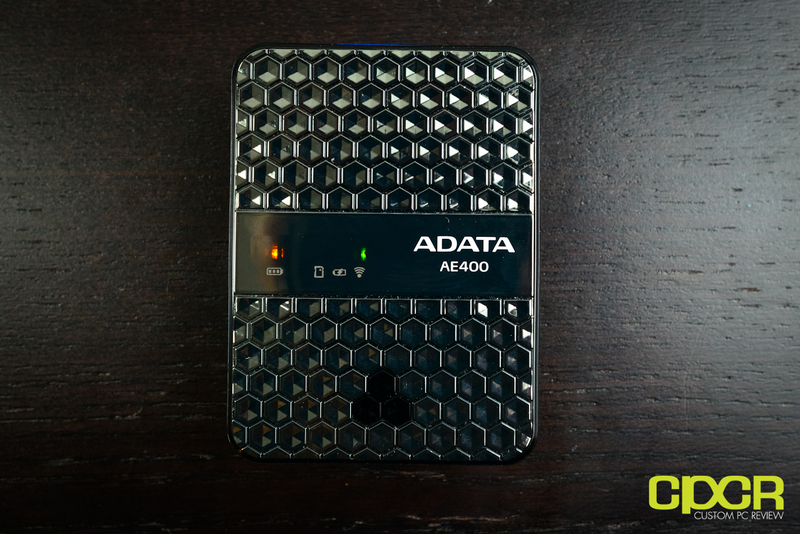 Unlike most of the wireless storage devices on the market, the ADATA AE400 doesn’t include any sort of internal storage and relies solely on either external USB drives or SD cards for storage instead. 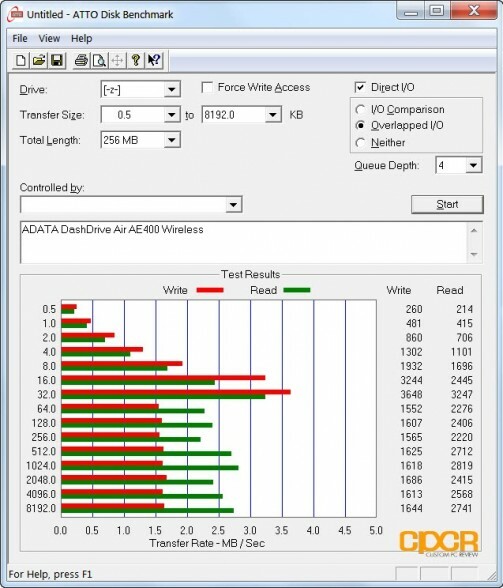 This is why ADATA refers to the AE400 as a wireless storage reader rather than a wireless drive. 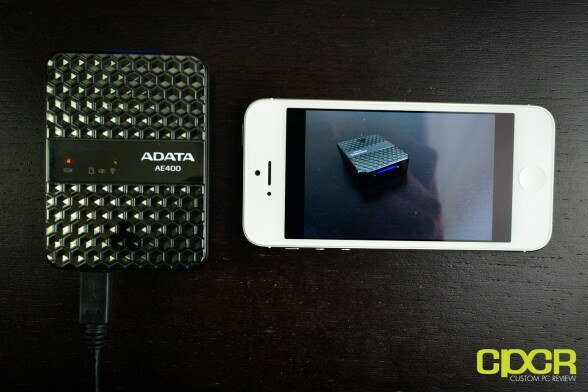 Additionally, ADATA also describes the AE400 as a power bank as well. This is because the AE400 also comes equipped with a 5000 mAh internal battery and is capable of charging mobile devices through its USB port. With that said, does ADATA offer something truly unique with the AE400? Let’s find out! 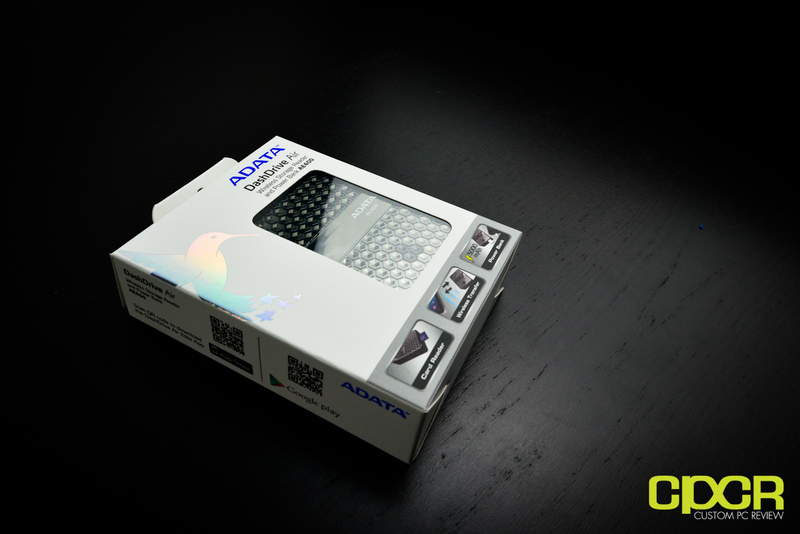 Here’s a look at the packaging for the ADATA DashDrive Air AE400. 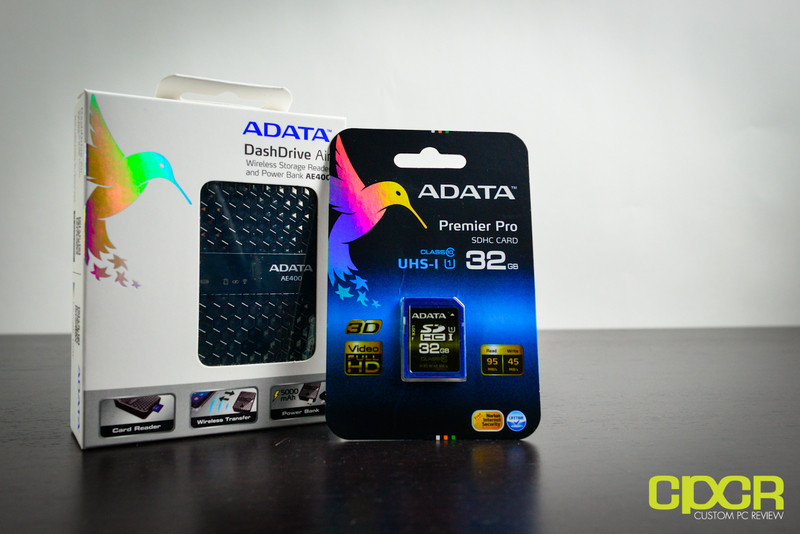 For our review, ADATA has also provided the ADATA Premier Pro 32GB Class 10 SDHC card with our sample for testing. The ADATA Premier Pro 32GB SDHC card supports the high speed UHS-I standard and is rated for up to 95 MB/s reads and 45 MB/s writes. This card is quite fast, so it should be able to avoid any bottlenecking due to the SD card. 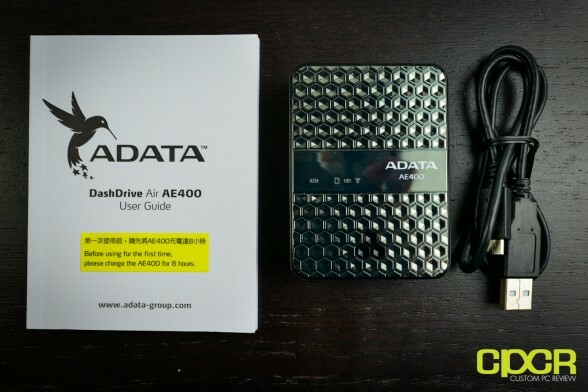 Included in the packaging we get some documentation, the ADATA DashDrive Air AE400 unit itself along with a micro-USB cable. At the top of the AE400 we get a SD card slot. 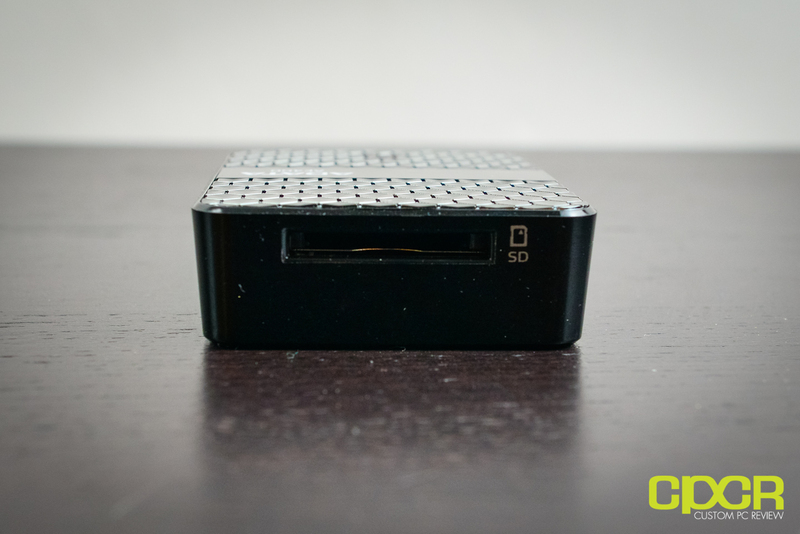 The slot supports SD , SDHC, and SDXC cards. 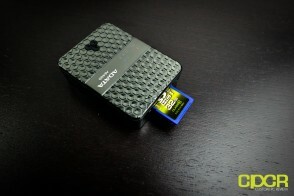 SD cards are a fantastic option for storage as they’re small, common, and rather inexpensive these days. 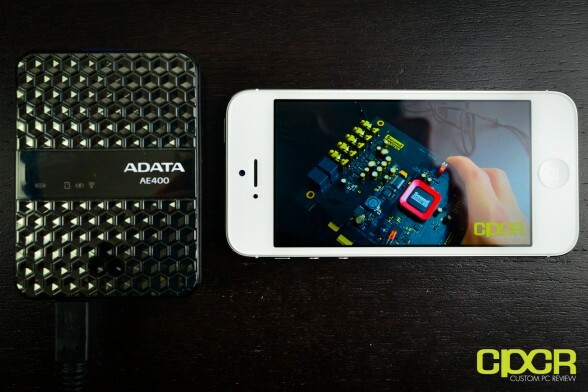 At the bottom of the AE400, we get a micro-USB port along with a standard USB 2.0 port. The micro-USB port is used for charging the internal battery and can also be used for transferring data as well, which effectively turns the AE400 into a USB card reader. The standard USB 2.0 port can also be used to connect USB storage devices such as flash drives. Unfortunately in my testing, the AE400 does not support NTFS formatted drives, so drives must be formatted with exFAT or FAT32. 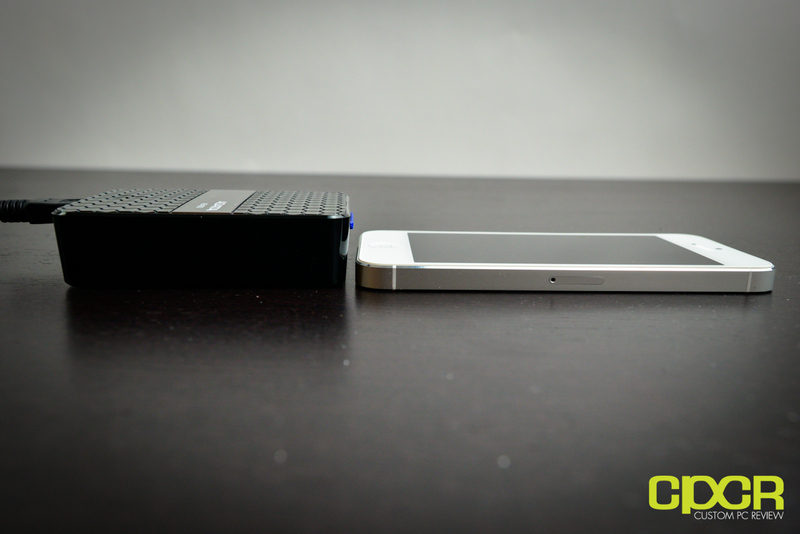 Here’s a comparison between the iPhone 5 and the AE400. 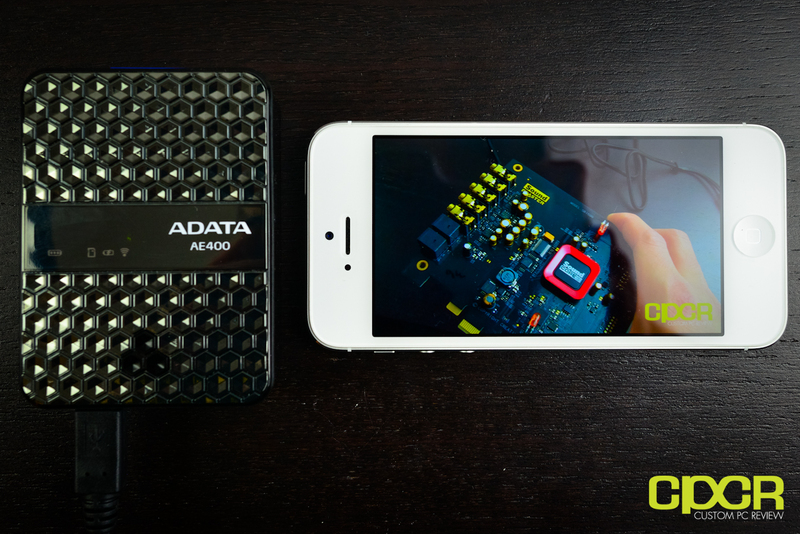 The AE400 is thicker in design, but is shorter in length. Pushing down the little black button at the front of the unit, we can switch on the AE400. By default, the AE400 turns on in wireless transfer mode, which allows wireless devices to connect to the unit and allows for the AE400 to act as a wireless hotspot for up to 10 simultaneous devices. Pushing the button a second time puts the AE400 into power bank mode, which allows for charging of the USB device connected. As you can see here, my iPhone 5 is able to charge through the AE400 without issue. 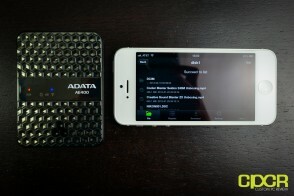 ADATA claims that the AE400 is capable of up to 2 full charges for an iPhone 4S (1,432 mAh battery). 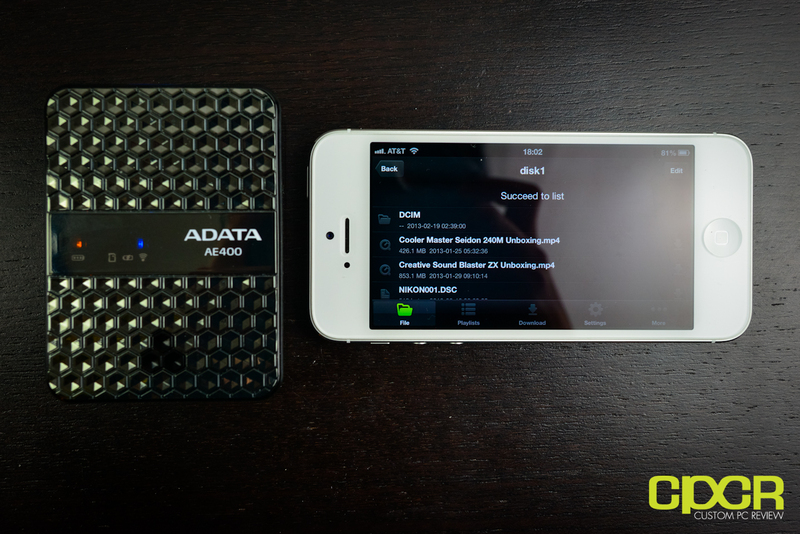 Finally, the third mode on the AE400 is both the wireless transfer mode and power bank mode combined. 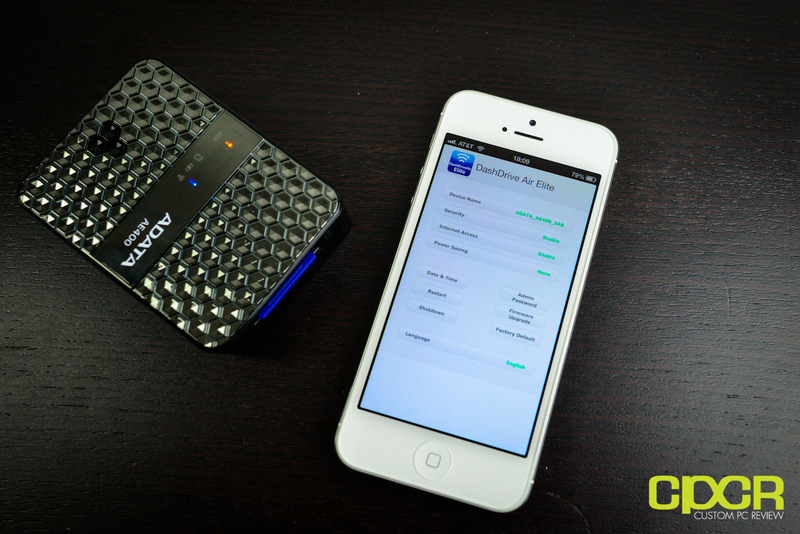 This allows the AE400 to charge your mobile devices and work as a wireless hotspot simultaneously. 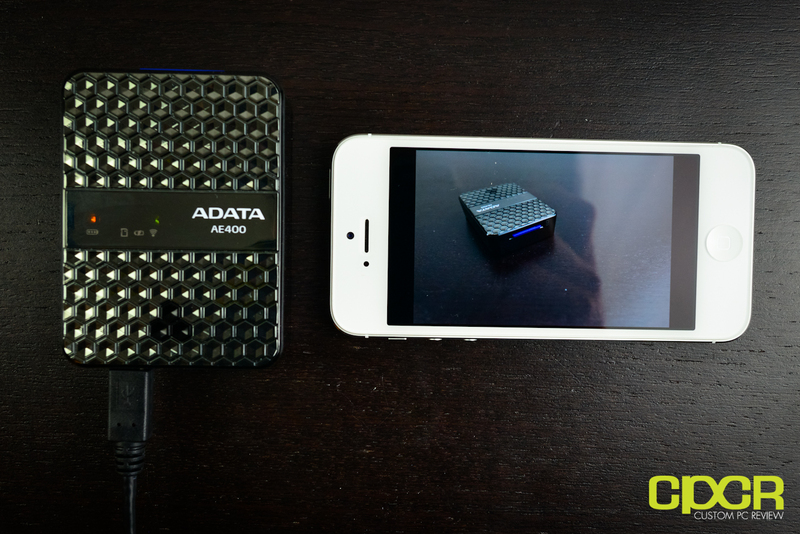 Here’s a look at the AE400 with the ADATA Premier Pro 32GB SDHC card installed. When installed, the SD card fits very flush with the unit. Now, let’s test this thing out! For Apple mobile devices, you can download the DashDrive Air Elite app from the app store. Android users also have an app as well, but we’ll only be testing the iOS app today. The first menu item in the DashDrive Air Elite software is the all files menu, which as you can see is simply a directory browser. The nice thing about being able to read from a SD cards is the fact that pictures taken off cameras and videos taken off camcorders can instantly be shared through the AE400 with multiple mobile devices. Here I have one of the product shots taken with my DSLR just moments ago. 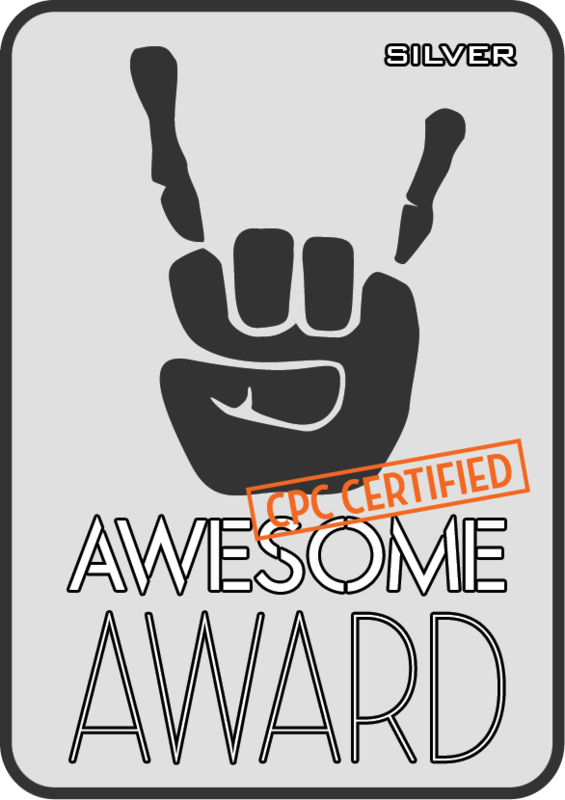 1080p video streaming worked alright depending on the quality of the video. 720p and lower bitrate 1080p video streamed over the AE400 perfectly fine while high bitrate 1080p video lagged and studdered after the initial buffered part of the video was over. Since the DashDrive Air Elite software is missing some codecs for video playback, you can also use popular video playback apps such as OPlayer to play media files from the unit. The AE400 supports the Samba protocol, so files on the device can be seen through Windows file sharing on your PC or MAC as well. In addition to being able to browse photos, documents, videos, etc on the AE400’s connected storage devices, you can also upload files on the devices as well. 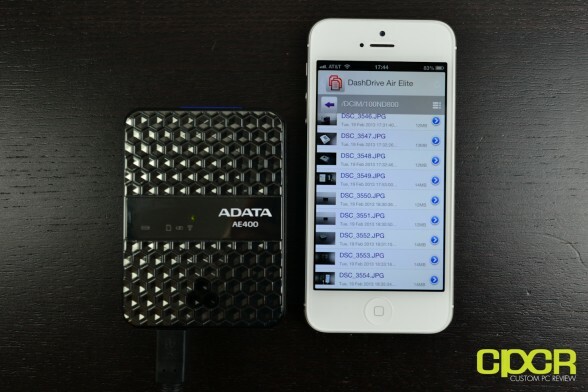 The DashDrive Air Elite app conveniently also has a local files menu which allows you to browse your local files and put them onto the AE400’s connected storage devices. The iOS DashDrive Air Elite app also includes a convenient menu for adjusting your settings as well. 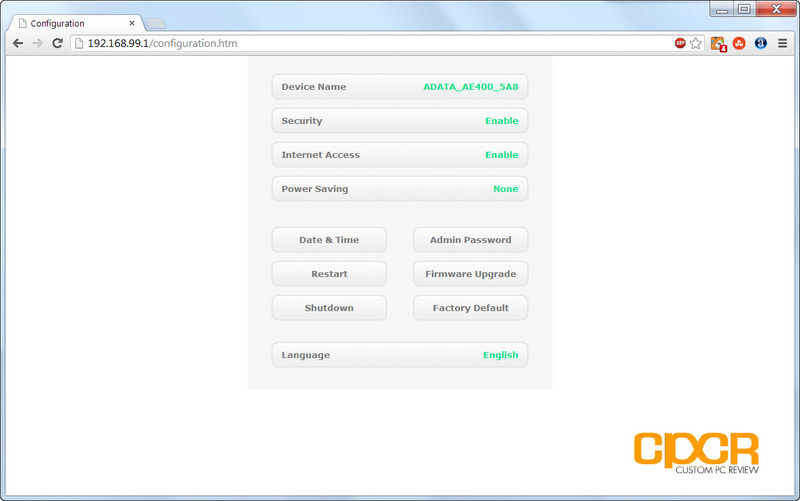 In Windows, settings can be changed by logging into the AE400’s web interface at 192.168.99.1. For those who’ve worked with routers and modems, this should be very familiar to you. The settings menu allows you to setup stuff like the wireless password, wireless bridge mode, power save mode, firmware upgrade, etc. The interface isn’t the most elegant we’ve seen to date, but it gets the job done. Since the AE400 can be used as a wireless bridge, I ran a couple speed tests in order to determine if there’s any latency or bandwidth sacrifices by using the internet through the AE400’s bridge mode. The test on the left shows my notebook connected directly to my wireless network while the test on the right shows my notebook connected to the AE400. As you can see, there is a small bandwidth sacrifice by using the AE400 as a network bridge, but overall it’s not too bad – at least with my internet connection, which isn’t all that fast. 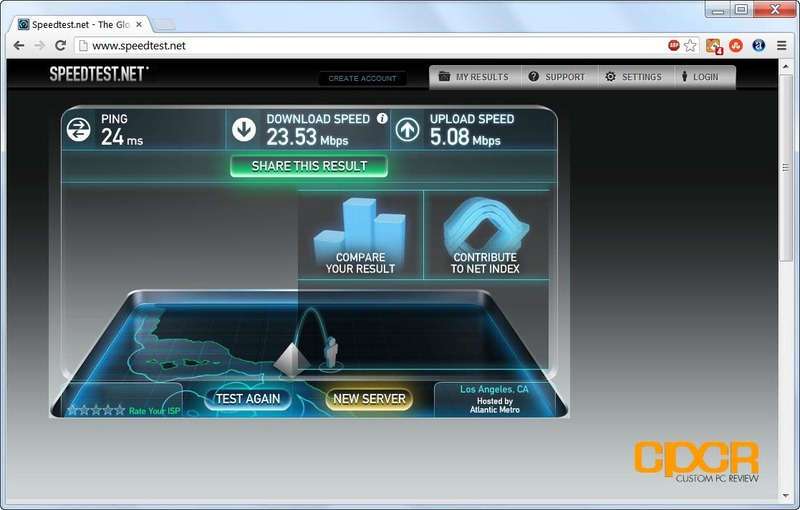 The maximum download speed with the notebook connected to the AE400 acting as a bridge was approximately 19.40 Mb/s while the maximum download speed with the notebook directly connected to the router was 23.53 Mb/s. 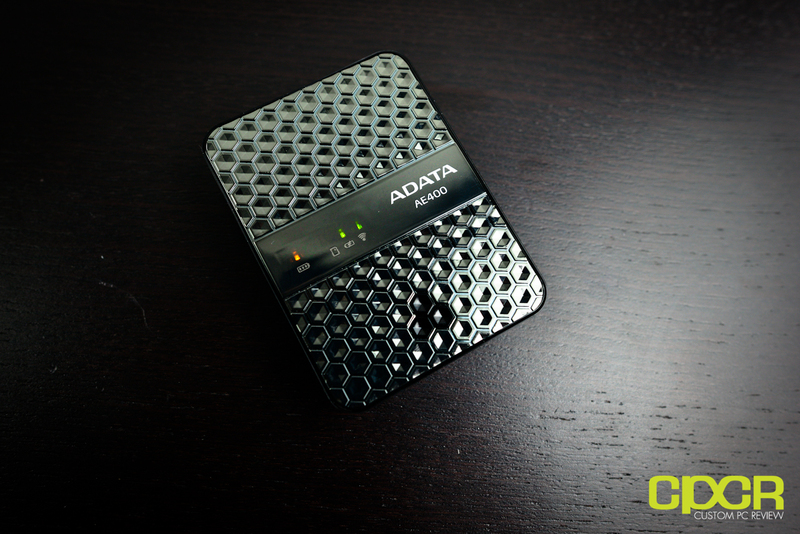 One of the major functions of the AE400 is to serve as a wireless card reader. 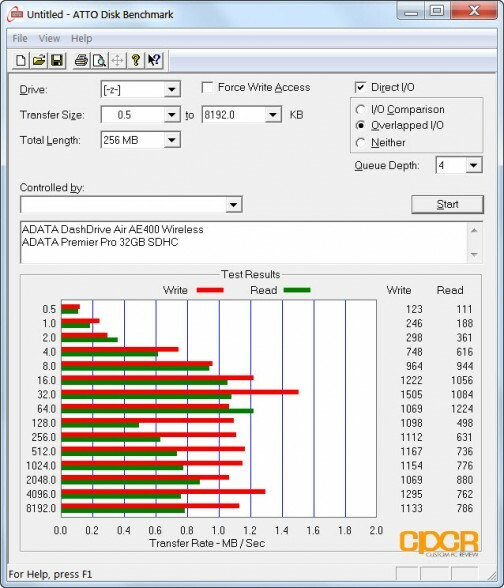 For testing, I plugged in the ADATA Premier Pro 32GB SDHC card and ran ATTO Disk Benchmark with a notebook that was connected via the wireless interface on the AE400. Performance here is quite unimpressive with the AE400’s only outputting an average of around 0.8 MB/s reads and 1.1 MB/s writes. The AE400 is also capable of being used as a wireless interface for USB storage devices. 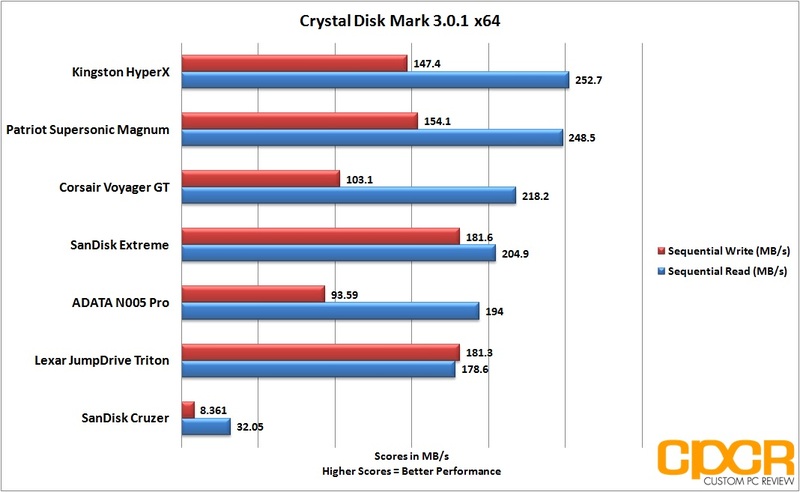 For testing, I plugged in the Kingston HyperX 64GB USB 3.0 flash drive, which I’ve found to be capable of up to 252.7 MB/s reads and 147.4 MB/s writes. Unfortunately with the flash drive connected to the AE400’s USB interface and the notebook accessing the flash drive via the wireless interface of the AE400, I was only able to average around 2.7 MB/s reads and 1.6 MB/s writes – a far cry from 252.7 MB/s reads and 147.4 MB/s writes the HyperX USB 3.0 flash drive is actually capable of. 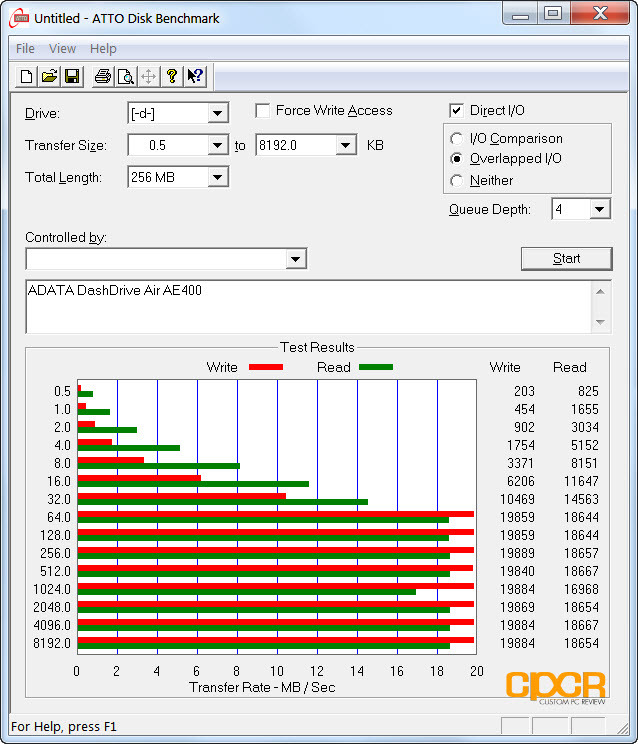 Here’s a look at the AE400 in USB card reader mode (the AE400’s USB connected to notebook’s USB 3.0 ports with the ADATA Premier Pro 32GB SDHC card installed in the AE400). As we can see here, the AE400 is obviously a USB 2.0 device as it’s limited to around 19.8 MB/s writes and 18.6 MB/s reads. Alright, since the AE400 is both a wireless storage reader and a power bank, let’s talk about both these features individually. As a wireless storage reader, the AE400 is really dead simple to use and the functionality is fantastic. Simply connect the storage devices, turn on the AE400, connect your mobile devices to the AE400’s wireless hotspot, and you’re good to go. 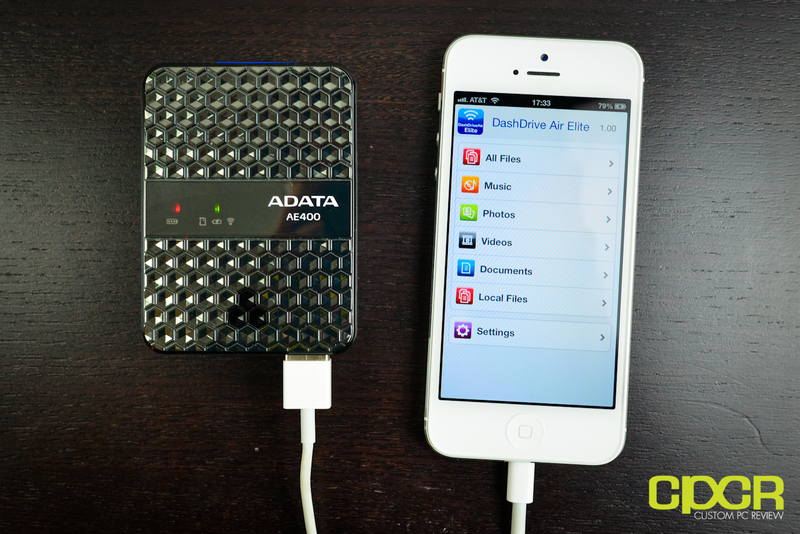 If you’re using iOS or Android, simply download the DashDrive Air Elite app from the app store to access files. 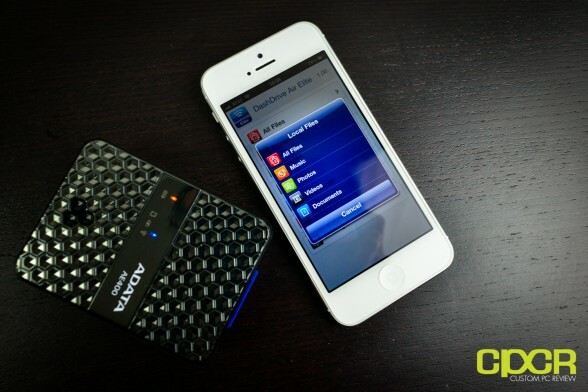 If you’re on the PC or Mac, simply look for the AE400 on your network and the device shows up as a Samba shared drive. Because the AE400 supports sharing of files via the Samba sharing protocol, 3rd party apps for iOS and Android such as the Oplayer app on iOS can also access the AE400 as a Samba shared drive as well. This allows media files with codecs that aren’t playable with the DashDrive Air Elite app to be played on the 3rd party apps such as the Oplayer app instead. While everything on the AE400 is easy to use and easy to setup, I think ADATA needs to do some work on improving performance when accessing the storage devices. 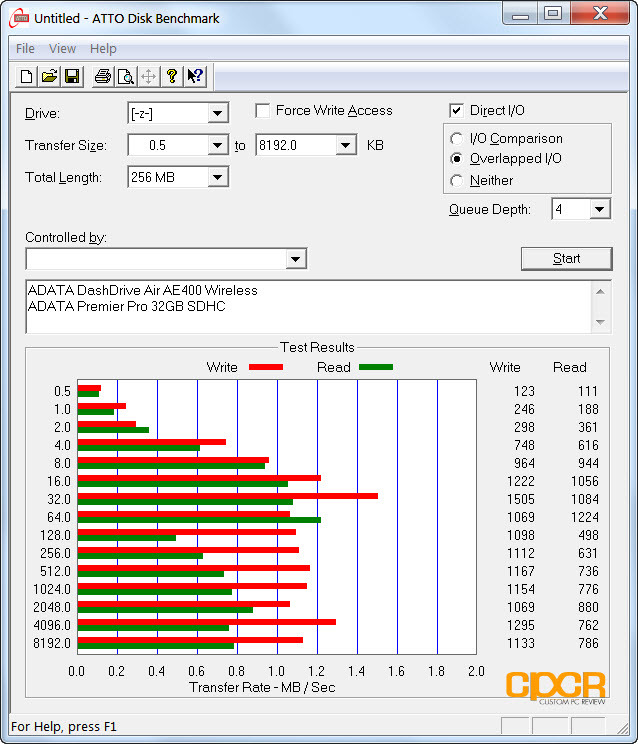 While connected via wireless to access the SD card slot, performance averaged only around 1 MB/s read/writes, which is quite slow considering the ADATA Premier Pro 32GB SDHC card tested today is capable of up to a blazing 95 MB/s reads and 45 MB/s writes. While connected via wireless to access the USB drive, the USB drive averaged only around 2.7 MB/s reads and 1.6 MB/s writes, which is many times slower than what both USB 2.0 or wireless N is capable of. Now, I’m hoping this can be improved via a firmware update since I know the hardware itself theoretically should be capable of faster transfer rates, so we’ll see what happens in the coming months. 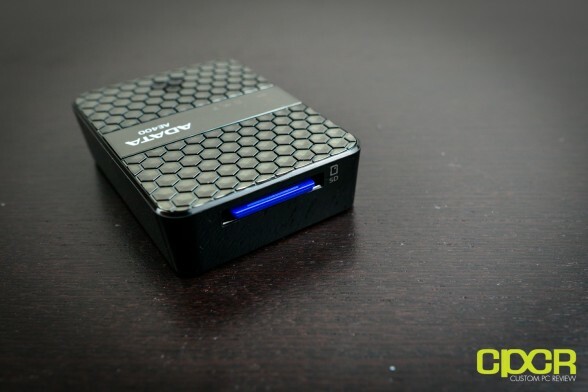 Additionally, the USB connection to the PC could also use an upgrade to USB 3.0 as well. As it stands right now, the connector is USB 2.0 only, which means the flash drive reader is capable of a maximum of only around 19-20 MB/s read/writes give or take. With many of the higher end SD cards easily capable of pushing over 20 MB/s and with USB 3.0 becoming increasingly common, the lack of USB 3.0 makes the AE400 feel dated despite the fact that it’s a newly released product. As a power bank, the AE400 worked perfectly as advertised as well. It was able to charge my iPhone 5 without any issues and the entire process was pretty much plug and play. I was easily able to charge the iPhone 5 from around 20%-90% multiple times with juice leftover on the AE400. No problems here. That said, the USB charging port on the AE400 is rated at a maximum of 1.5 amps. While it’s much better than a 1 amp charger, it still does take a significantly longer time to charge devices when compared to a 2.1 amp charger. Personally, I think it would be great to see a 2.1 amp charging port on the next revision of the AE400, especially for those looking to charge more power hungry devices such as tablets. The ADATA DashDrive Air AE400 is expected to retail for around $79.99, which I think isn’t bad at all considering that it’s a wireless bridge, card reader, and a mobile device battery pack all in one little package that literally fits into the palm of your hand. To be honest, I think the AE400 is almost worth the money just as a battery pack alone. That said, those looking to use the AE400 as a wireless storage reader should be aware that the AE400 does have some limitations in terms of performance, but ultimately it does what it’s advertised to do and I see no reason not to recommend it when it hits store shelves in the near future.